From producer Aaron Spelling comes one of the toughest, action-packed crime-fighting shows of them all. 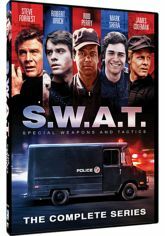 Spun off from The Rookies, and fueled by its signature hit theme song, S.W.A.T. chronicles the covert missions of the LAPD's Special Weapons and Tactics unit. The elite five-man team included Lt. Dan "Hondo" Harrelson (Steve Forrest), Officer Jim Street (Robert Urich), Sgt. "Deacon Kay (Rod Perry), Officer Dominic Luca (Mark Shera), and Officer T.J. McCable (James Coleman).